This is the first in what will be a regular monthly update on things going on at the Bike Fed. The Bicycle Federation and our members are doing many great things to make Wisconsin an even better place to ride a bike. This is not intended to be a comprehensive listing, but once a month we will give readers a quick overview of some of those efforts. The Bicycle Federation of Wisconsin is pleased to announce Dave Schlabowske has joined our growing staff and will serve as the Communications Director. For the last six years Dave has worked as the Bicycle and Pedestrian Coordinator for the City of Milwaukee Department of Public Works. Prior to that, he was the Milwaukee Program Manager for the Bike Fed. In fact, Dave opened the Milwaukee office, so this brings Dave’s career in bicycle advocacy full circle. 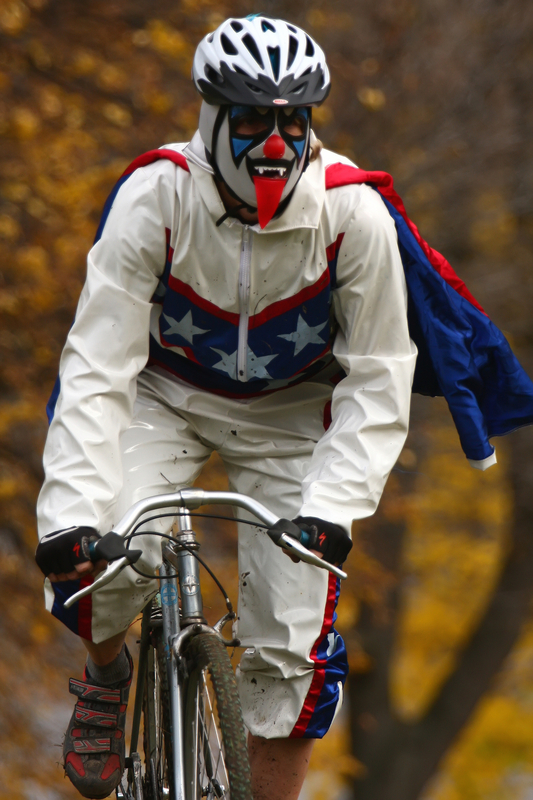 Along with his passion for cycling, Dave has brought this popular personal blog, Over the Bars in Wisconsin, to the Bike Fed. Here you can expect to find daily posts with fresh information about all things cycling in Wisconsin. Over the Bars features include advocacy alerts, trail reports, features about riding in different parts of the state and even information about new products from our great Wisconsin bicycle manufacturers and small businesses. The easiest way to keep your fingers on the pulse of Wisconsin Bicycling is to subscribe to Over the Bars via email (See the button to the right), or RSS feed, but you can also like the Bike Fed on Facebook or catch us on Twitter. You can get to know Dave a little better (and see him without the mask) at this recent post. The Bike Fed worked very closely with legislative leaders and fellow transportation interests to restore $2 million to the state budget recently signed in to law by Governor Scott Walker. These funds provide critical resources for local communities across Wisconsin who are working to better plan for and build more bicycle-friendly places. Our success has gotten strong national press. Read more here. Spate of Fatal Crashes – Are we safe? So far this year six people riding bicycles have been killed in crashes with motor vehicles. Because four of those have occurred in the last six weeks alone many are now questioning how safe Wisconsin’s roads are for cycling. Despite the tragic deaths and the unusually short time period, riding a bicycle remains an incredibly safe activity. More than 2 million people experience safe and enjoyable rides each year in Wisconsin, yet on average only 10 people are killed in crashes. While even one death is too many, as long as people follow the rules of the road and ride with a bit of caution, no one need fear riding a bicycle on the roads in Wisconsin. 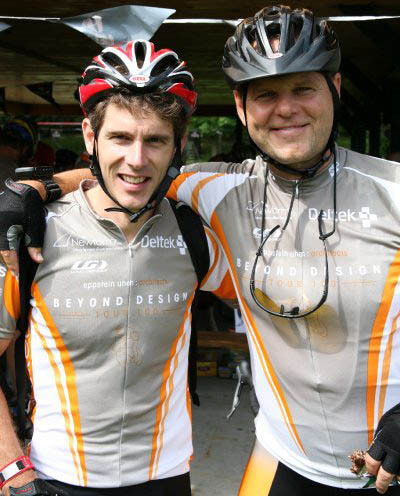 Eppstein Uhen has selected the Bike Fed as the beneficiary of their 2011 Beyond Design Tour. The bike tour will be held on Friday, September 23rd starting and ending in Pewaukee, with proceeds benefiting the Bike Fed’s Safe Routes to School and Share & Be Aware Programs. The ride is sponsored by area companies and is Wisconsin’s premier business networking ride. Sign up to sponsor or register for the ride and be a part of this fantastic day of riding, networking and supporting bicycling in Wisconsin. Bicycling is the new golf! In the 1960s, half of all kids walked or biked to school, while only 5 percent were driven in personal vehicles. Today, the numbers are nearly reversed, with dramatic impacts not only on children’s well-being, but also on community health, public safety and environmental concerns such as traffic congestion and auto emissions. Leaders of a national movement called Safe Routes to School will work on solutions to these issues during their third biennial conference Aug. 16 – 18, 2011, in Minneapolis. The Bicycle Federation of Wisconsin is pleased to announce the recipients of education stipends to attend this year’s conference through the generosity of Saris and Trek Bicycle Corp.
Make an Impact – You can still register and join approximately six hundred influencers in the Safe Routes to School movement are expected to gather at this conference. Attendees will include Safe Routes to School state coordinators, state Safe Routes Networks representatives, civil engineers, city planners, school and parent organization representatives and others dedicated to establishing safe and healthy habits for a lifetime. The conference will serve as a venue to discuss ideas, resources, projects and best practices that will help to improve the health, safety and environment of children in our state through policy, partnership and infrastructure. This conference is hosted by the Minnesota Department of Transportation and Blue Cross and Blue Shield of Minnesota; presented by the National Center for Safe Routes to School and the Safe Routes to School National Partnership. We’ve just selected 30 winners for this month’s Get Up & Ride Wisconsin Bike Challenge! Find out if you are a winner by clicking here. So far, we’ve given away over $4,000 in prizes. There are still 2 months to go, so you can still sign up to log your miles and have a chance to win more great prizes! 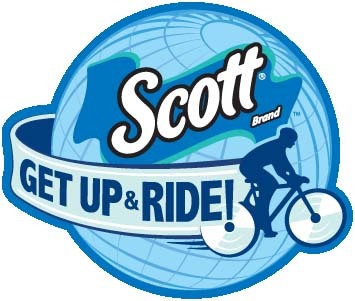 Click on the image to be taken to the Scott Challenge site and start logging your cycling miles. For the best chance at winning a prize in August, September or one of our exciting grand prizes, you need to keep pedaling! Plus, at our current total of 859,000 miles logged, we’re so close to reaching our goal of 1,000,000. Keep logging those miles! Congratulations to all 4,500 participants. Our Challenge survey indicates that over 30% of you are biking more because of the Challenge! As a group, you’ve burned 28 million calories, prevented 437,000 lbs. of CO2, and saved $216,000 in car expenses. We have been sharing our Challenge results with important leaders across the state and they are impressed. Each of you is playing an important role in moving bicycling forward in Wisconsin. Thank you! Here are a few results (based on transportation miles/trips) at our half-way point. Remember, you can see real-time reports 24/7 by clicking the Reports tab on the main Challenge site. Great job to these leading companies, teams, and individuals! Our PO Box will remain the same. We will be operating from the new space beginning Monday, August 22. Our phone number will remain the same, but thanks to the generous donation of a slightly used phone system each Madison staff member will now have a separate voicemail box. Stop by and visit us! A few weeks ago I was down in Atlanta and paid a visit to the headquarters of the Atlanta Bicycle Coalition for a T Shirt and some swag. Their office was a storefront at a highly visible location. All of their swag and posters were prominently displayed visible to all passerby. I thought what a nice thing this would be for the Bike Fed. I could picture the Bike Fed’s Milwaukee office in a storefront right on Wisconsin Avenue … the Grand Avenue is looking to lease space to non profits to get some activity there…. As an aside, cyclists in Atlanta need all the help they can get. Dave, that is exactly what we want for the Milwaukee office after we finally get the Madison office moved. Finding a space we can afford on a street with a bike lane is the next trick. I was thinking there might be something on S. 2nd or just off it in the 5th Ward. Any readers know of a good space? South Second Street is a great bike street, probably my favorite in the whole city. But there’s hardly any foot traffic and no transit routes down that street. Something right on Wisconsin Avenue, even though there’s no bike lane, would be great exposure for biking in Milwaukee. Practically every downtown transit route in town goes down Wisconsin, and it’s hands-down the most active pedestrian zone in the city. Picture a bunch of bikes parked on Wisconsin Avenue all the time, in front of a storefront with bike maps, posters, etc. on the busiest street in town. What a statement. With the pathetically high retail vacancy rate on the avenue, it might be possible to swing a good non-profit deal for a storefront. I bet the Westown or Eastown BIDs would be happy to help out … just a suggestion. While the proximity to beer is enticing, I think the BFW really needs a storefront, with a big window, just as Dave described. The Danish Cycling Union has a very similar office in Copenhagen, and tons of people were in there buying shirts and maps when I visited. Not related to the previous chat I have this observation. When driving from Madison along Cottage Grove Road seeking the Glacial-Drumlim Trail head, there is not a single sign indicating the location of the trail entrance until one is at the trail. I know there are signs on I-94, yet it seems curious there are no signs at all along the local arteries. Why is this? Cottage Grove seems to need all the business it can get. Is this a matter for BikeFed? Paul, I fee the same way. I often bike from Madison to Milwaukee when I have to work out of our Madison office. The trails are all well marked out to Cottage Grove, but you would never know the Glacial Drumlin is there without a map. I will talk to our Madison staff and the Wisconsin DNR about this to see if any directional signs could be added. I do know that the WDNR did not have money for signs along the Hank Aaron State Trail. The Friends group for the trail raised all the money to purchase the signs and the City of Milwaukee DPW put them up for free.